BASF Corporation, the North American affiliate of German chemicals group, BASF SE; Univar, a US global chemical and ingredient distributor and provider of value-added services, have expanded their agreement to include the Care Chemicals business for the US Home, Industrial & Institutional, as well as Vehicle Care product lines. Univar operates hundreds of distribution facilities throughout North America, Western Europe, Asia-Pacific and Latin America. As a leading supplier in North America, and with dedicated technical experts to help customers overcome their formulation and application challenges, Univar serves as a trusted advisor to customers in the Household & Industrial Cleaning (HIC) segment. BASF's Care Chemicals business offers a broad portfolio of products for the hygiene, personal care, home care, industrial & institutional cleaning, as well as technical applications. Additionally, BASF's leading position in the HIC market coupled with Univar's breadth of technical services, global network reach, and industry leading digital commerce platform, provides unmatched support for customer formulation needs. This expanded agreement enables Univar customers access to the complete range of HIC products within BASF's portfolio, while also enjoying the support of our dedicated HIC labs across the country and technical experts with excellent formulation competency. 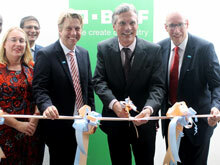 On a related development, BASF has unveiled a new office in Dar es Salaam, Tanzania. The office will offer both sales and technical support to BASF Tanzania customers.BASF began doing business on the African continent about 90 years ago focussing on the key industries of construction, textiles, automotive, agriculture, plastics, and healthcare sectors. The new office will now expand BASF’s footprint on the continent and will nurture partnerships and innovation geared towards sustainable growth. According to BASF’s Vice President for Africa, Michael Gotsche, part of the company’s growth strategy in Africa is to invest in local presence and local production. BASF has in the recent past opened offices in Zambia, Ivory Coast and Kenya.